Provided photo Barbara Cooper and her dog Bailey show off some of the craft sodas that will be available at Connections of Tipp City, a new place for teens to hang out after school on Fridays at 35 E. Main St. in Tipp City. TIPP CITY — In hopes of providing an after school hangout for Tipp City’s teens, a local pastor is launching a new endeavor that’s part retro soda shop, penny candy store and youth center. Barbara Cooper, a pastor and music teacher, has launched Connections of Tipp City, which is aimed at offering middle and high school students a place of their own. “They don’t have a place to hang,” she said. Connections will be open on Friday afternoons this fall from 2:30-6:30 p.m. at 35 E. Main St. in downtown Tipp City. Cooper, who teaches music lessons at the Hotel Gallery, said she’d seen students roaming downtown after school and knew that they didn’t really have a place to hang out with their friends. Earlier this year, she said she felt God “nudging” her to provide that place. Kids can still go to Scratch Bakery or to the coffee shops and pick up snacks before heading to Connections, Cooper said. “Then bring it into this space for music and games,” she said. Teens can also enjoy visits with Cooper’s dog, Bailey, a therapy dog. Cooper said she has a lot of big plans for the project, including open mic events and workshops with area artists and musicians, but for now it will provide a weekly space for teens can gather for snacks and graft sodas, games and music. In the future, Cooper would like to find a permanent home for the soda shop. She is also working with local churches on the project and waiting for official 501c3 non-profit designation. But for now, she hopes teens come check out the space and offer their own suggestions for programming and events. “Connections is very much a work in progress,” she said. For more information about the space or how to donate to support its endeavors, Cooper has set up a Facebook page for Connections of Tipp City. 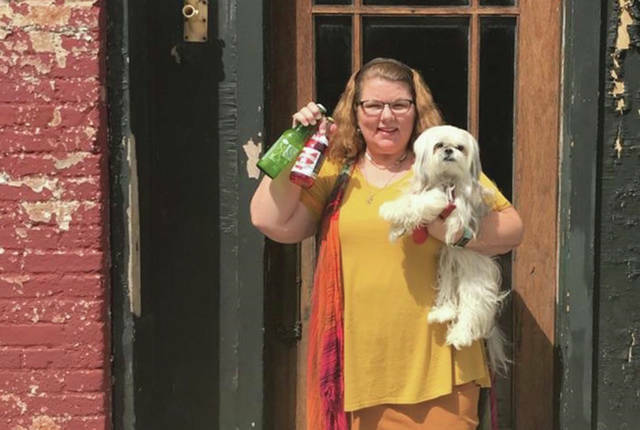 https://www.tdn-net.com/wp-content/uploads/sites/21/2018/09/web1_connections.jpgProvided photo Barbara Cooper and her dog Bailey show off some of the craft sodas that will be available at Connections of Tipp City, a new place for teens to hang out after school on Fridays at 35 E. Main St. in Tipp City.